Scrangie: Holy crap, Nubar HOLOS! 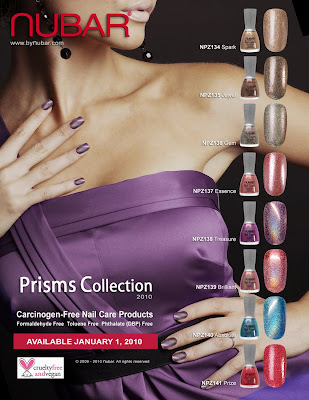 Prisms Collection 2010! Release date is January 1, 2010! From these promo pics, some look like Kaleidoscope-type holos and some look like they have holographic glitter. Won't know for sure until I see them in person. I just tried to make a better comment but blogger is nasty tonight, so I¨ll be happy for the seat you make very good dinners, please continue!! Blah! Seen that before (Nfu Oh, China Glaze)... Next! Wooooh. I knew there was going to be a pink holo in the new collection but not all those other fabulous shades. Brown holo? Tooo exciting!! :o I think there is only one that I'm not too keen on. They look beautiful, and I love Nubar. I think I will have a little bit of time to save for them because I'm in the UK and we'll get them a little later here. I just got the email too! I'm dying to see them IRL! Thank You for sharing! I just can't wait to get the red holo, I have been wondering where they are. Finally! OMG! I love holos and I love Nubar cuz they are Vegan and cruelty free! RED HOLO!!! I am so exciting. I've been waiting for one! Love! I too look forward to the red holo, and hope it is significantly different from many of the OPI DS holos...they are pretty, but I like variety :). Now if someone would make dark green, deep chocolate brown, yellow, and bright orange holos, I would die! These really are amazing, and I can't wait to see your swatches! We were fortunate enough to preview them at BeautyXpose.com, and we're giving away a set -- you can enter now through Dec. 20! Must have! Will skip watching Rose Parade to get them first thing New Year's Day! And we know that Nubar can do holos.. I just love Reclaim! HO MA GAWD! 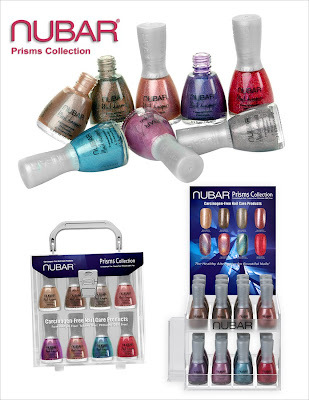 First China Glaze, then Zoya and now friggin' Nubar! Holos at that! I'm going to be so broke by the end of all this. As beautiful as they are, I'm not feeling these. I have some holos from the ChG OMG collection and I recently got Nubar Reclaim. It doesn't get much better than that... and I'm a die-hard creme lover, but I can understand what all the excitement is about. Now if I can just get my hands on the ChG "Up and Away" collection, I'll be one happy polish addict. I LOVE HOLOS! Can't wait for this! These look sick! looking forward to seeing these in a swatch. If the base color is similar to Nubar's duochromes, WITH the hologrammatic effect...this could be amazing.